It is estimated that up to 5% of Australians will have a seizure at some stage in their life. When someone has a seizure, doctors need to find out as much as possible so they can identify whether it is a ‘one-off’ seizure, epilepsy, or another condition that is easily mistaken for epilepsy. Diagnosing epilepsy is sometimes not easy, so it is important in the early stages to have a good relationship with your doctor and health care team. 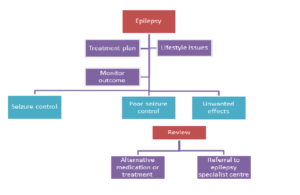 The following sections are to give you a better understanding of the medical tests used to help diagnose epilepsy, and some of the treatments available. For tips on how to prepare for appointments and make the most of your time with your doctor read our article in Epilepsy 360˚ Magazine Partners in Health – you and your doctor or download the Seizure Smart Factsheet You & Your Doctor. To diagnose epilepsy, your doctor will review your symptoms and medical history and may order a number of tests to help determine the cause of your seizures. An important part of diagnosis is an eyewitness account – a good description of the seizure(s) or symptoms. If possible, take someone who has seen the seizure(s) or events when visiting the doctor, so they can also be asked questions. Also try to find out if anyone in the family has ever had seizures before. As part of diagnosis, the doctor will do routine physical and neurological examinations which may include blood tests. If epilepsy is suspected, there are several tests that may help to diagnose the condition and possibly establish a cause. This is a brief guide to the tests that help diagnose epilepsy. Not everyone will need every test. If you are unsure why your doctor has suggested certain tests and not others, then it is best to ask. Sometimes, all or many tests for epilepsy can return normal. EEG – This is a non-invasive test used to look at the electrical activity of the brain. Neuroimaging – These are brain scans and include MRI, SPECT, PET and CT scans. Neuropsychological tests – Look at how your brain is working and how the epilepsy affects your day to day functioning. An electroencephalogram (EEG) is a test commonly done to look at the electrical activity of the brain – that is, the brain waves or how the brain is functioning. Brain cells communicate by producing tiny electrical impulses and seizures are a result of abnormal electrical activity, so it is logical to perform the EEG first. If a person is thought to be having seizures, they are referred to a clinic to have an electroencephalogram (EEG). It is a simple, painless test and involves no needles or injections. During the test, small discs called electrodes are placed on the surface of the scalp. The EEG machine then records the electrical activity of the brain on disc, computer or to paper. An EEG usually takes about one hour. It is important to be relaxed because movement can affect results. Most of the test is done with the eyes closed, and sometimes you will be asked to open them briefly. It is routine to be asked to breathe deeply (hyperventilate) for a 2-3 minutes and later have a flickering strobe light, flickering at various speeds. These forms of stimulus can provoke EEG changes in some forms of epilepsy. For the test, it is important to have clean hair and scalp. Do not apply any hair products such as gel or hairspray on the morning of the test. It is also important to inform the person doing the test of any medications you are taking. It is not uncommon for people with epilepsy to have a normal EEG in-between seizures. An EEG recorded during sleep can also give additional information. This may sometimes be needed if your first EEG returns normal. Also, no electrical current from the machine passes into the person’s brain during the procedure. The technicians cannot read your thought processes or know what you are thinking. This is a method of recording the EEG over a long period, which using both EEG and video recording. This is done in hospital, either on a ward or in a specialised video-telemetry unit. This procedure aims to record the person’s seizures (by video) and the brains electrical activity (EEG) at the same time. This combined information is one of the most valuable tools for diagnosing epilepsy. The advantage over routine EEG is the doctor is able to study exactly what happened during any attacks on the video and match this up with the EEG recording. This monitoring may be needed for a few hours or several days, depending on the frequency of symptoms and seizures. This monitoring is also used in the lead-up to surgery for epilepsy. Video telemetry is, of course, quite restricting and you will most likely have to stay in hospital several days. Most institutions need a family member or friend to stay with you as a ‘buddy’. This is for safety reasons and the person is also needed to quickly alert staff to a seizure. It is best to take something to do to keep you occupied. It can be a long, tiring and sometimes frustrating process. Some people may be asked to have a sleep-deprived EEG or video telemetry to record sleep which can increase the chance of detecting abnormal brain activity. If your routine EEG has been normal or has shown features which are not clear enough to make a definite diagnosis, the doctor may ask for a sleep EEG. Sometimes abnormalities associated with epilepsy can become more apparent in EEG during sleep. The EEG changes a lot during sleep and sometimes these changes can trigger abnormal EEG changes seen with epilepsy. For this procedure you will be asked to have less sleep the night before. This increases the chance of recording abnormal electrical activity. It is not a disaster if you do not sleep during the test, because even if you just become drowsy, there is still the chance of detecting abnormal activity. The test can be performed in the same way as for a routine EEG or video telemetry, depending on the unit, but the person is asked to sleep during the test. Occasionally sleep is induced by a mild sedative, which is given about half an hour prior to recording, but most times you will be put in a quiet, relaxing environment with a bed and lights out. Sometimes abnormalities, events, or seizures are not picked up on the above tests. The hospital setting is far from normal, and often you are not under the everyday stressors that can trigger events. If the doctor would like something more wants to record a seizure or event, an ambulatory recording may be needed. This can be done when the person at home. Ambulatory recordings are done when it is necessary to do a recording over several hours or days, making it more likely to detect any abnormalities or seizures. A compact portable EEG recorder may be worn which records brain activity while the person carries out usual daytime activities, and also during sleep. The person will also be asked to keep a diary of symptoms. The electrodes are glued to the scalp and connected to the compact portable EEG recorder. This device is to be worn at home and there is usually a button you can press to mark an episode on the device. This allows the EEG to be recorded over a much longer period than a routine EEG – for several days if need be – and in a normal setting. This greatly increases the chances of finding abnormalities. It is also more likely to actually record the EEG during an event, particularly and this may allow doctors to decide whether the events are seizures or not. The recording may also give a very clear picture of any patterns and how often they are occurring. It is a very useful and cost effective tool to help in the diagnosis of epilepsy or other events. When used for epilepsy, neuroimaging is images (pictures) taken of the brain, or a brain scan. It can be done to look at the structure and function of the brain. These scans may further help when diagnosing and treating epilepsy. MRI or Magnetic Resonance Imaging looks at the brain structure. It generates clear and detailed images of the brain without the use of x-rays, but instead uses strong magnetic fields and radio waves. Images can be generated in either two or three dimensions. The MRI machine makes loud thumping and banging noises. Earplugs or earmuffs should be available. Because of the strong magnetic field people with pacemakers, cerebral aneurysm clips and any other metal surgical implants will not be able to have a MRI scan. It is important to remove jewellery, hairclips, hearing aids, credit cards, coins, keys, even makeup and hair gels which could interfere with the scan. The MRI scan is not known to have any harmful effects. It is best to tell staff or your GP when booking the scan if you suffer from claustrophobia (fear of being in a confined space) and you may be allowed to take a light relaxant before the scan. A functional MRI measures the changes in blood flow that happens when specific parts of the brain are working. Doctors may use an fMRI before surgery to identify the exact locations of critical functions, such as speech and movement, so that surgeons can avoid injuring those places while operating. Click here to see more. SPECT ScanningSPECT uses a computer to generate pictures of the blood flow within the brain. It is often done twice, once when no seizure has occurred (interictal) and another immediately after a seizure (ictal) – although the radioactive substance is injected and absorbed while the seizure is happening. Blood flow in the area causing seizures should be lower in-between seizures and increased during seizures. This test is often used as part of the workup for surgery for epilepsy. PET scanning measures metabolic activity showing how the brain is working (function) rather than how it looks (structure). It produces a 3D image of the brain. In a person with epilepsy, the area causing seizures will have less activity because the cells are not as active in-between seizures (unless a seizure occurs when the substance is injected which will increase brain activity in this region). The person will be asked to fast for the test because it is glucose metabolism that is being measured. With someone with epilepsy, often a video telemetry EEG is performed at the same time, so it is necessary to arrive early to set this up. PET may be done to help establish if someone is suitable for epilepsy surgery. Computed Tomography (CT) is a procedure that uses x-rays to take pictures of the brain. It is not commonly performed when trying to diagnose epilepsy. CT scans can show abnormalities in the brain that might be causing seizures, such as tumours, bleeding, and cysts. Although these tests don’t diagnose epilepsy, they assess a range of learning domains including thinking, memory and speech skills. This gives your doctor an overall picture of how well your brain works and if there are any areas that aren’t working well, which may be the area causing the seizures. It can also help find out how the epilepsy is affecting your ability to reason, concentrate, solve problems, or remember. Most of the tests done include answering questions or performing tasks. You may do some on a computer, using pencil and paper, or using other objects. The tests are meant to test your limits, so don’t be disheartened if they seem hard. People with epilepsy have a number of choices when it comes to treatment, but medication is the first option used. Up to 70% of people with epilepsy can get seizure control with antiepileptic medication. For people who have poor seizure control despite trying different medications, there are now some other treatment options available. Medication is the first line of treatment in the management of epilepsy. With regular medication and a sensible lifestyle a full and active life is possible. Epilepsy surgery can offer some a chance to be seizure free or significantly reduce the number of seizures. Only certain types of epilepsy are suitable for this treatment. VNS uses a pacemaker-like device to periodically stimulate the left vagus nerve in the neck to reduce the frequency and intensity of seizures. The ketogenic diet was developed for controlling seizures, particularly in children with poorly controlled epilepsy. The modified Atkins diet is a less restrictive diet that also seems to help with seizure control in adults and children. Many people are now using alternative or complementary therapies in some way – to improve their health, combat illness and even prolong their life. Self-management is when someone with a chronic disease takes an active role to help manage their own illness. It includes things such as making healthy lifestyle choices and informed decisions about treatment, and actively monitoring and managing symptoms. These practical tips may help you to better manage your seizures and gain more control of your life. Try to make it part of your daily routine like taking your medications at meal times. Put your medications in a safe, visible place as a reminder. Set a watch, phone or alarm clock to remind you. Use a chart or calendar and tick when you have taken your medications. Consider using a pillbox or ask your pharmacist to pack your medications into a pill pack. These usually have the day and time you are supposed to take the tablets. Ask someone to remind you. Other medications, including over-the-counter medications may interfere with how antiepileptic medications are absorbed, or make you more prone to having seizures. Speak to your doctor before taking any new medications. Check with your doctor before taking any other medications or supplements and always report unwanted side effects or medication reactions to your doctor or pharmacist immediately. There are also many different brands and generic medications on the market for epilepsy and your pharmacist may offer you one of these as an alternative. Be aware that a generic product may not be exactly the same as the original brand and the non-active ingredients may differ – these include fillers, binders, coating or colouring. While specific guidelines and tests are conducted to make sure the generic medications are the same, a slight degree of variation is allowed. These slight variations may affect seizure control in some people. Even a minor variation in blood levels of an anti-epileptic medication can lead to a higher risk of seizures – or possibly toxic side-effects for some people taking doses that already border on toxicity. The slightest change can make the difference between a medication not working, a medication working well, or being too strong. Whether you are changing from brand to generic, generic to brand or generic to generic, this may increase your risk of seizures. So if your medication is working, continue with it – do not switch brands without discussing with your neurologist or prescribing doctor. Generics sometimes have a different name, different packaging, different tablets, and are often slightly cheaper. Sickness such as vomiting and diarrhoea (which may also be side effects of antiepileptic medications) can affect reduce how much of your medication is absorbed so may trigger seizures. Also imbalances in your body’s fluid and electrolytes can occur due to dehydration increase the chance of seizures. Guarana is a natural caffeine source and a stimulant. It is a common ingredient in high energy drinks and herbal ‘weight loss’ teas and can combine with adrenaline to produce an even stronger stimulant effect. Any substance that is considered a stimulant should be avoided or taken with care and moderation, as they are more likely to increase the risk of seizures. It’s hard to know exactly how much caffeine is a problem, as its effects on the body vary from person to person. The rough guideline for the average person is to drink (or eat) less than 600 mg per day – around four cups of strong coffee, or five or six cups of tea. This would probably be less for someone with epilepsy. So limit your intake to two or three drinks at most. Avoid large amounts of caffeine or switch to decaffeinated drinks. Grapefruit and Seville oranges may impact seizure control. There are substances in grapefruit that can interfere with the way the body absorbs and breaks down certain medications, increasing or decreasing levels of the dose in the bloodstream. One of the medications affected is Carbamazepine (Tegretol). DO NOT drink grapefruit juice or eat grapefruit in any form if taking Carbamazepine (Tegretol, Tegretol CR or Teril) until you have talked with your doctor or pharmacist. Avoid taking any medication with grapefruit juice until you discuss with your doctor or pharmacist. Read the labels on foods and natural health products to make sure they do not contain grapefruit or Seville oranges. Triggers are events or circumstances that make people with epilepsy more likely to have a seizure. Identifying your seizure triggers and trying to avoid them is important for gaining better control of your seizures. Avoiding seizure triggers can be difficult sometimes, so it is important to weigh up the risks and look at overall quality of life. Common seizure triggers are; missed medications, fatigue, sleep deprivation and stress. Seizures usually involve temporary changes in behaviour and movement. Even so, it is often difficult to diagnose. There are a number of common events that can mimic or be confused with seizures, and vice versa. Here we discuss the most common medical events that can be mistaken for seizures. This is a sudden and short-lived loss of consciousness due to a sudden decrease in blood flow to the brain. Fainting is most commonly confused with epilepsy because sometimes the person can have brief jerks, twitching or convulsive movements while they are unconscious. Up to 50% of children and adolescents, and 6% of the general population experience episodes of fainting. Fainting is easily diagnosed from an eyewitness description. There are many possible causes and triggers, and a good history of the episode can often help to differentiate between a faint and a seizure. When someone has jerks, or what seems to be a seizure immediately following a faint, it is often called convulsive syncope. While convulsive syncope can be difficult to differentiate from a seizure, it is usually very easy to treat. It may happen again with future faints, but it is not linked with epilepsy. Migraine is very common. Just like seizures, there are different types of migraine, and some present with an “aura” which can be mistaken as other conditions like seizures or stroke. Some migraine sufferers don’t even have a headache associated with their migraine. Also, migraine can have similar triggers to seizures. Fainting may occur during the migraine. Some types of migraine may begin with loss of consciousness and other symptoms, and then be followed by headache. Visual or sensory changes may be mistaken for focal seizures. However, migraines usually last a lot longer than seizures. It should also be noted that EEG changes may be seen in people who have migraine. These are often called ‘mini strokes’ and as the name suggests, are only temporary. They occur because of a brief period of insufficient blood supply to certain areas of the brain, usually resolving within 24 hours. The person can experience weakness and sensory changes, such as numbness and tingling, and often these symptoms are what may be confused with seizures. TIAs usually last longer than seizures and loss of consciousness is rare. Like seizures, sleep disorders can be characterised by confusion, unusual behaviour and abnormal movements. Sleep disorders that may be confused with epilepsy include night terrors, sleep walking, movement disorders, bed wetting, sleep apnoea, REM sleep behaviour disorders and narcolepsy. Dizzy spells can be caused by any number of circumstances, including the conditions listed in ‘drop attacks’ section above. This describes a group of neurological disorders that involve the muscles and movement systems of the body. Tics and involuntary movements may sometimes be confused with myoclonic seizures or focal seizures where awareness is retained. However movement disorders do not cause loss of consciousness or EEG changes, although the condition often responds to antiepileptic medication. There are many different causes of movement disorders including Parkinson’s Disease, Huntington’s Chorea, Tourette’s Syndrome, sleep disorders and essential tremor. These are common in children aged 18 months to six years. They usually occur after the child has become frightened or upset. The child may cry for a short time then subsequently lose their breath. They can then become limp, faint, arch their back or jerk their limbs. Sometimes breath-holding can lead to a seizure, but this is not considered epilepsy. Daydreamers can appear vacant, stare unintentionally and not respond for a short time. In children this is common and can be confused with absence seizures. The difference is that daydreamers will respond to touch or loud noises while someone having an absence seizure will not. These occur when the heart isn’t functioning properly. Examples are when a person has an irregular heart rate or clogging of the arteries which can cause dizziness or blackouts, depending on the severity of the condition. A febrile convulsion is seizure that happens in babies, toddlers and children when they have a high fever. This is because the developing brain of a toddler or child is more sensitive to fever than an adult brain. There also appears to be a tendency for these seizures to run in families. Between 2-4% of children have one or more febrile convulsions by the age of five years. Approximately two thirds of these children will only have the one seizure, while others will have a seizure with following fevers. For most children the risk of developing epilepsy is no different from that of the general population and their intellect and development is not affected. A very small proportion of febrile seizures are more complex – that is, prolonged seizures that are longer than 15minutes, multiple seizures in a short period, or if seizures have focal features. In this group the risk of developing epilepsy is higher but still low. Very occasionally, seizures can occur within seconds of a head impact. These seizures are non-epileptic and occur as a direct consequence of the impact. They are not associated with any structural brain injury and do not lead to further seizures or epilepsy. The person is managed as you would for someone with concussion. Some people genuinely believe they’re having a heart attack, are losing their mind, or on the verge of death. Panic attacks can occur at any time. An attack generally peaks within 10 minutes, but some symptoms may last much longer. Usually it is possible to identify these attacks from the person’s descriptions of what happened. Occasionally focal seizures may cause similar symptoms. These are sudden explosive outbursts that appear often and without warning, are out of control and totally out of context to any triggering event in the environment. The events seem out of character and are sometimes attributed to epilepsy. There can be many different reasons why someone these outbursts. In practice, rage that occurs with, before or after an epileptic seizure is unprovoked and usually not directed at anyone in particular. These are characterised by a change in a person’s behaviour, perception, thinking or feeling which can resemble, or be mistaken for, a seizure. However, these seizures do not have the EEG changes that accompany an epileptic seizure. This seizure type has an emotional or psychological cause rather than a physiological one and can be seen in people with or without epilepsy. Around 1 in every 6 people who go to a specialist epilepsy centre for investigation of poorly controlled seizures have PNES. The best way to find out if any event is a seizure is to record it on a video EEG. Unfortunately capturing the event can be difficult, as they are often sporadic, short-lived and unpredictable, and many people don’t have access to these services. Therefore, a careful description of what happened is extremely valuable. Diagnosis is more difficult without this eyewitness description. Sometimes a home video of the event can also help. It is important to obtain a correct diagnosis to avoid being treated with medication unnecessarily. Unfortunately, sometimes this does happen. In these cases, the chosen treatment does not work mainly because it is not the right one for the condition. If a person does not respond to antiepileptic medications, further tests may be needed to explore other possible diagnoses. Sometimes a doctor may decide to wait and see if a similar event occurs again before undertaking further testing.